What is the difference between 1974 and 1974 1/2 TR6s? My car: 14 Aug 1974 TR6 (Chassis CF25186UO, engine CF25521UE, body T24431CF), originally Carmine colour, Black (Ambla) interior. This is very near to the last of the "1974" cars. All 1974 cars have the rubber bumper over-riders. 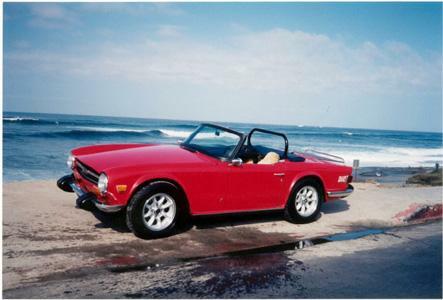 1974 was a rather unique year to the TR6, as there was a design change approximately mid-way through the year, and so there is a model distinction, the so-called "1974" and "1974 1/2" models. Chatting with some other owners, I have found that the cars of Becky Sforza (CF25689U) and Scott Mackay (CF25718UO) and Chad Jester (CF25738UO) are 1974s, while the cars of Mike D'Ambrogia (CF 27282UO), Carel Allen (CF27463U), Flemming Larsen (CF27518U), Ken Streeter (CF27535U) and Steve Sutton (CF27991UO) are 1974 1/2. It appears then that the switchover took place sometime between CF25738 and CF27282. Typical changes from 1974 to 1974 1/2 were the raised front bumper, indicator lamps moved below the front bumper, indicator lamp colors changed to white and amber. It also appears that the ignition keys became "two sided" in the 1974 1/2 models. Last update: 7 Nov 2002.